How fun to see my hometown pop up in my reader! Greenville is a fabulous place. I feel so fortunate to live here. Check out Design*Sponge, a fun and inspiring blog. Click on the picture for the link to the city guide. ...friends, family and a wonderful husband willing to set up his tipi for two very special nephews. Well, here it is. Vogue 8615. It's my own fault it didn't turn out the way I thought it would. My own indolent actions determined the fate of this dress. I reverted to some old shady sewing habits. I was doing really well the past few projects, not cutting any corners. I thought I could slide by on few things here and there... I think we all know how that turns out. Mistake number one was not making a muslin. I had just finished with my dumb luck perfect fit shirtdress so I figured why make a muslin? (pure laziness). Mistake number two was my fabric choice. The pattern envelope lists shantung as a recommended fabric and I assumed dupioni would be pretty much the same thing. I've read now that shantung is lighter, softer and has more drape than dupioni. My fabric is extremely crisp and it doesn't drape well at all (excuse the wrinkles-- I had enough of the dress to iron it). I does weird things on the skirt and sleeves. To be fair, my sewing started off well. I was okay until I got to the sleeves. There was a huge amount of ease. I actually read that on another review, too. Mistake number three was not taking out some of that ease. I just sort of gathered the sleeve head and let it be a little puffy (again- laziness). It contributes to the the feeling that I'm wearing a little girl's dress and looks sloppy. Also contributing the the little girl's dress feeling is the fact that it is a slightly too big. I think it could stand to be tighter everywhere except the shoulders. One of the things that drew me to this silhouette was the little nipped in waist contrasted by the full skirt. Both Gertie and Rachel achieved it and it looks fabulous on both of them. I'm pulling it behind me in the above photo but if you look at the last photo you can see what I mean. There isn't a big difference at the waist. After I finished the bodice and sewed up the skirt and I already knew I wasn't going to like it. By the time I put everything together I lost all enthusiasm for it. In fact, I did such a crappy job that my seam lines don't match up (really-- look closely). Extremely sorry sewing, my friends. I didn't notice until taking pictures. On the positive side, however, I love my handpicked zipper. I'm so excited about how wonderful it turned out. I was in the thrift store today noticing hand picked zippers in vintage dresses. Made me feel like I really knew my stuff to be able to notice things like that! Also, horsehair braid is really fun. What an easy way to finish a circle skirt. It's really sculptural. My fabric is a little too lightweight for it. I can see the top edge. An underlining would fix that, I believe. I'm sad that this beautiful fabric won't get worn-- at least not in this form. I'm thinking about taking off the bodice, taking out some of the fullness of the skirt and slapping on a wide waistband. But not anytime soon. I should have been working on my abandoned Lady Grey :) I've learned my lesson. Steph recently gave away a dress she considered to be a guilt piece. You know- good fit, great sewing, but you put it on and feel you're wearing someone else's frock. I never wear her though she's a great dress- hence the guilt, she wrote. I'm pretty sure I am currently making a guilt piece. It's made from gorgeous olive green silk dupioni and the sewing is pretty good (if I do say so myself :). But unfortunately, I really don't see myself wearing it. The pattern is Vogue 8615. I thought I'd jump on the vintage full skirted trend, but I kind of always knew I wouldn't like it. It's the full skirt I'm not too pleased with. I think full skirts look great on people who are petite or very, very thin-- I'm neither. Anyway, we'll see. I'm going to finish it because I believe that beautiful olive green silk dupioni deserves to be finished. On the bright side, whether I wear it or not I've learned some new things. This is the first time I fully lined something. I used Sewaholic's handpicked zipper tutorial which may be my new favorite sewing technique. I hate putting in zippers on a sewing machine. There is so much more control doing it by hand. I'm not sure I'll ever put one in by machine again. All the dress needs now is to be hemmed and I'm planning on using Gertie's tutorial for using horsehair braid. Maybe that will change the way it hangs and I'll like it more. Right now I feel like a large set of drapes in it. I promise to post pictures wearing it whether I like it or not :) Thanks for reading! So named because this was one of the worst experiences I've had sewing something with the best result. I quite like it now that it is finished but I was cursing it (literally) while I was making it. I've had this McCalls 4769 pattern in my stash for a long time. In fact I believe it was one of the first patterns I bought when I started sewing. I thought the pattern looked pretty easy (it said 8 great looks one easy pattern on the envelope!) and that it was a classic shirtdress. I decided to use it as part of my quest to use different apparel fabrics. This time- Tencel. Tencel is a brand name for lyocell, which is a fabric made from wood fibers. It's supposed to be environmentally friendly but I've read that only applies to the process of making the fabric. The process of dyeing Tencel on the other hand, not so much. It's comparable to rayon but a bit heavier. This is a peach skin type. It has a slightly suede-y looking finish. It was moderately easy to sew with. I had the most trouble cutting. It was a little slippery. I pinned a lot and noticed that my pinholes stayed. I've heard that Tencel will shrink like crazy so I washed the fabric twice on hot before cutting out my pattern pieces. I'll wash the finished dress in cold water and hang up to dry. Now on to the worst pattern instructions ever- they weren't really that bad but the collar has me harboring a grudge. I've never seen a collar constructed this way so maybe that has something to do with it. The problem was just that there was no proper explanation of how to put it all together. The collar is a separate piece while the lapel part of the collar is actually part of the dress. It's all supposed to fit neatly between two little clips that you make on the front pieces and the facings. The best way I can explain it is that you end up having to sew together two acute angles backwards-- does that make sense? No, not to me either. The instructions basically just tell you to sew it together, like figure it out on your own. I was not able to match up those dots and clips with collar sandwiched between without some sketchy looking stitching, even after my six (yes, six) attempts on the right side. It may be easier with a crisper cotton fabric, but I still don't quite understand how it works. I tried to make the sleeves from view E, kind of a faux cuff thingy going on. They looked terrible so I chopped them off and hemmed the sleeves. I'll probably always wear them rolled up anyway. Another thing I didn't like is that the facings stop at the shoulder seams leaving about four inches of collar that need to be clipped and slip stitched. It just looks a little messy. Why not make the facing go all the way around? It took me forever to make this dress, hours and hours, which makes me think they should get rid of the one easy pattern line. I've noticed, though, that the more I sew the longer it takes me to finish a project. See the strange looking right side? I steamed the heck out of it until it was somewhat flat. I did a better job on the other side. I ended up stitching the collar/facing seam in two seams rather than one continuous. I stitched up to the clipped dot, backstitched and took it off the machine. Then I shifted all the fabric around and stitched the rest of the seam back from the shoulder seam to the dot. I still had to steam it to get it to lie flat. The good points are that the fit is great- no adjustments. And there are pockets. That's always a plus. I didn't use the guide for button placement. I started at the bust and waist and then spaced the rest evenly. I think I used more buttons than the pattern called for but I like the way it looks. I left the length. It's a little longer than I would normally wear, but I like it with boots. My conclusion is that while I like the finished product, I will not be using this pattern again- unless someone can explain the collar construction. Thanks for reading! I enjoy reading when my fellow sewing bloggers write about where they live so I thought I'd post about my city. My husband and I went downtown today with camera in hand for the Open Studios event that the Metropolitan Arts Council organizes. 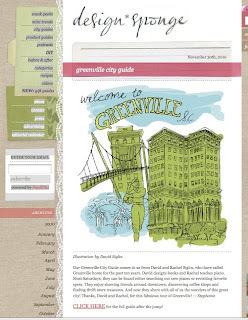 Local artists all over Greenville open their doors to the public. It was fabulous! I saw some amazing studio spaces and a lot of very inspiring artwork. I had a great time taking pictures and it was nice to see a lot of people out taking advantage of these artists' hospitality. We saw so many incredible spaces that when I looked back through my pictures I realized I couldn't label all of them. I noted what I could remember. Thanks for looking! I am sewing. Like crazy, actually. Funny that I don't have much to show for it this week. I've done a lot of small projects. I finally covered a bench cushion that I promised a friend two months ago. Of course I didn't take a picture. It was quite an experience, covering a cushion that has some depth to it. I couldn't find a simple tutorial anywhere. I figured it out on my own employing a what little bit of geometry I remembered and felt super proud of myself. I made a few samples during my trial runs and thought, hey, that would make a great little zippered box pouch. Then I looked up box pouch tutorials and found tons, exactly the way I made the cushion cover. Ah, well. I also made pajama pants, and they are fabulous. I bought some Amy Butler flannel on sale a while back with no idea what to use it for. One of those fabric.com-need-to-make-it-to-$35-for-free-shipping purchases. I made the pants from McCalls 5989. I even used french seams because I knew I wanted them to last a long time. I'm going to try and make up the top to go with. I have worn them every night this week-- very practical sewing project. I made more finger puppets for a friend- so fun. They all look sort of smug, don't they? And last but not least, I have been padstitching my little heart out. I am a terrible padstitcher. In the spirit of blog truthfulness, I have posted a picture of my awful stitching. I don't have a lot of patience for this sort of thing, but I'm trying. One lapel down. Now if I could just bring myself to work on the other. One day my Lady will be finished.... (I hope). I have several other projects in the works. I made a shirt dress from the worst pattern ever. Well maybe not the worst pattern ever, but definitely worst instructions ever. It just needs buttonholes. I'll post about it soon. And I've cut out some olive green silk dupioni to make a fancy one year anniversary dress. We'll see how that turns out :). Thanks for reading-- I hope your sewing ventures are more fruitful!